A Kansas City Fashion Blog. 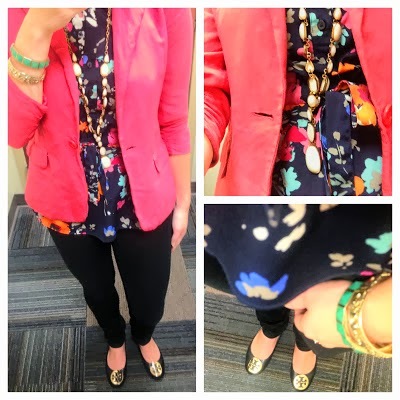 Awhile ago, I talked to you about my love for colored and patterned blazers. We all need multiple blazers in our closets but I think there are three staple blazers everyone needs: a nice black one, a fun colored one, and a fun patterned one. I have my nice black one, a fun red colored one I wore yesterday, and today's patterned one. 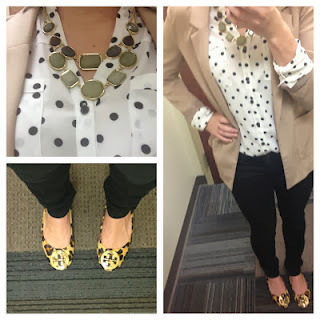 I snagged this leopard blazer up from New York and Company last year after Christmas for only $8! It was way too cute to pass up :). I would love it if you would follow me on GFC or BlogLovin'! I have a confession for all of you. Up until about a year ago, I considered gingham a total "boy print". (Whatever that means!) Last Fall I started noticing a ton of my favorite bloggers wearing it so I started to think of it in more of a feminine way. I found this shirt on a crazy sale ($5) at Old Navy so I decided to try it out. I'm so glad I did because I absolutely love it! It is the perfect shirt for layering. Since buying this one, I have purchased more colors from different stores. What do you think? Are you into the gingham trend? Good morning, everyone! I hope you all had a great weekend. Homecoming was so much fun. It was great to see all my friends, eat at our favorite restaurants, and go to the usual bars. Highlights of the weekend include the homecoming parade, a corn hole (or bag toss) tournament, and a live band at a bar playing great dance music! It was great to be back at school but I am definitely glad that I am no longer a student :). A trend that I really loved earlier this year was the Peter Pan Collar top. However, I wanted to find a cheap version of it so that I could make sure I actually liked it before splurging for one. I looked at Forever 21, Charlotte Russe, Marshalls, H&M, you name it and could not find one. Most stores didn't have them at all. The only place I ever found one was at Forever 21 but it looked very cheap and wasn't exactly what I was looking for. So, when J Crew Factory had 50% off their entire store a few weeks ago, I took it as a sign that I should just purchase the shirt I wanted all along. I love how it looks with a neutral outfit but I know there are so many more styling possibilities with it! It's official. The worst season ever is almost upon us. Winter - I'm talking about you. Today was the first day I had to scrape my car windows before leaving for work :(. Snow is pretty, but I hate the cold! If only it were possible to have the scenery that comes with winter without the temperatures. Anyways, last week I talked to you about my obsession with tights. This week, my tights are polka dotted. I seriously love them! Don't worry, the guys I work with have already commented on them. Read about the fashion haters I work with here ;). Have you guys seen the musical Hairspray? When I put on my polka dot tights today, all I could think of was a line from one of the songs where they go "Circle circle dot dot dot, hurry get your cootie shot!" The song may be about a person with cooties, but here I am choosing to use it to refer to the pattern of my tights. Also, a childhood friend posted on her blog yesterday about controversial Halloween costumes. A company is selling a pro-anorexia costume called "Anna Rexia". First of all, I cannot believe a company would sell a costume glorifying a disease. Secondly, I cannot believe someone would actually buy it. You can read the article here. Living in the Midwest makes having a good coat is a necessity. If you're similar to me, this is really just an excuse to own more like 20 different coats. 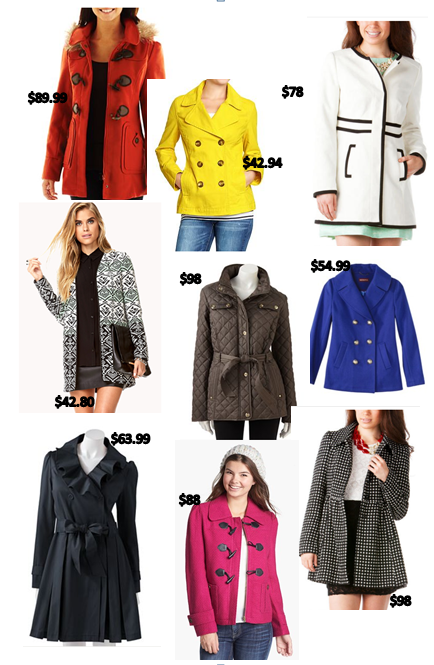 A fun way to bring cheer into typical dreary weather is with a fun color or patterned coat! I usually buy one new coat a season. It may seem like a lot; but when you are wearing jackets from October - April, a girl needs variety! I personally am partial to pea coats. I think they look great with jeans, skirts, dresses, etc. I started my search for a good coat yesterday, and have found a ton of great options to choose from. The best part? ALL of these are less than $100.00! Which one of these do you like best?! I was looking at my coat collection this weekend and realized I have only dark colored coats; gray, black, navy, royal blue, green, and camel. This year, my new coat will be a bright pink or an orange! Thank goodness his parents came to help, because I do not know how we would have gotten everything moved by ourselves. I think I'm pretty strong, but there is no way I could have gotten a washer and dryer up to the second floor! His parents brought their sweet puppy, Razzie, along for the ride. It made me wish we had a dog, but we just don't have the time for one right now :(. A full Saturday of moving meant Starbucks was a necessity. For my birthday a few years ago, Tyler gave me coasters made out of scrabble letters. At the time, we were in a LDR and were obsessed with playing Scrabble on our phones against each other. The coasters are each themed around a certain type of drink. One is coffee, one is beer, one is wine, and one is random. Well, in the move I found out he had more letters and cork board! We have enough materials to make 4 more coasters. I played around with sayings on them while Tyler organized the garage on Sunday. Around 1 PM on Sunday, Tyler and I decided it was too nice out to stay inside all day. We got on Stub Hub and bought tickets to the Chiefs football game! We had to take advantage of the beautiful Fall day. It was such a spur of the moment decision to go to the game, but since we waited until last minute to purchase tickets our tickets were only $25! We have tickets for a game in November, and I can't wait to go back :). I just checked my email and found out that I was nominated for the Liebster Award by Alina at Alinitini! The Liebster Award is an award given to up and coming bloggers with less than 200 followers. Thank you so much, Alina, for the nomination :). Purple, Mint, and the Liebster Award! Everyone... I have a very real obsession with tights: black tights, colored tights, and patterned tights. You name it, I probably want it. I purchased two new pairs of tights this weekend to start preparing for the colder weather. The first, are these red cable knit tights. I have been obsessed with tights ever since high school. 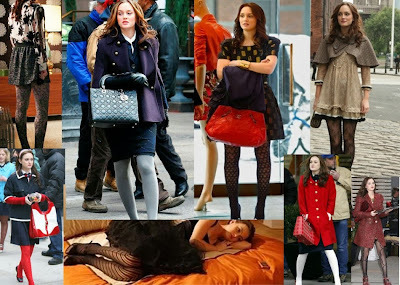 If I'm being honest, I think it's more Blair Waldorf from Gossip Girl that had me totally crushing on tights. This article does a great job showcasing Blair and her many tights. Get ready for a tight-filled Winter over here at A Memory of Us! It's my personal goal to make a tight lover out you by Spring ;). My full time job is a system engineer and I am on a predominantly male team. Out of the 45 people on my team, 5 of us are girls. This means that, for the most part, my coworkers don't understand what us girls are wearing. One day I was wearing a green bubble necklace and a coworker told me he liked that "green thing on my neck". Now, he was complimenting me so his intentions were good... but did he really not know what a necklace was!? Lately, one of the guys has been "yelling" at all of us girls for wearing scarves. He says "it's not cold enough out yet for those!" (Doesn't he know scarves are a fall staple!?) Well, it was 50 degrees out this morning so I think it's officially scarf weather! P.S. is anybody out there watching The Blacklist!? It is on NBC after The Voice and is so good. None of my IRL friends are watching it, so I need someone to obsess over it with! Happy Friday! You may have picked up on the fact that where I work has a very laid back dress code. We are a "jeans casual" dress code. This essentially means that we are supposed to be dressed business casual but can swap in jeans for dress pants. On Fridays, though, it seems like you can find a lot of people wearing a sports team t-shirt. It's kind of an official rule that on Friday's you can support your favorite sports team! I am not big into t-shirts for the office place, but I decided to dress it down a little bit today anyways. Burnt orange is one my favorite colors for Fall, and this boyfriend cardigan is perfect for a casual outfit! And as always... Friday is Starbucks Friday! To say I was running behind this morning is quite the understatement. I went to the gym first thing this morning and planned to get ready there. Traffic was strangely horrible this morning and I got to the gym 15 minutes later than usual. Not wanting to skimp on my workout, I still completed the whole thing... which meant I was getting ready as fast as possible! Why am I telling you all of this? Well, because I didn't have time to take an outfit picture this morning. I know that it only takes a couple of minutes, but I just couldn't be any later! Let this be another reason why I need to start taking outfit pictures at times other than in the morning before I go to work! Luckily, when I was picking out my outfit last night, I took a picture of it all together! I love the way this purple pops against the black and white stripes. This jewel toned cardigan from Express is the perfect fall color; I know it will get a lot of wear this season! Hello, everyone! You may have noticed that I have been making some changes here at A Memory of Us. I have been working on the layout, adding widgets, and adding other pages to my blog. I thought I would dedicate today to sharing with you everything that has been happening over here! First of all, there are now links over on the left hand side of the page that will send you to my Instagram and my Pinterest page! Go check out these links and connect with me on other sites :). Next, I created an About Me page and a Contact page! You can learn more about me and my vision for the blog, or reach out to me if you have any questions or collaborating ideas on these pages. Lastly, I have added a "Pin It!" button to each of my pictures on the blog. From now on, you can pin any of my images to Pinterest. 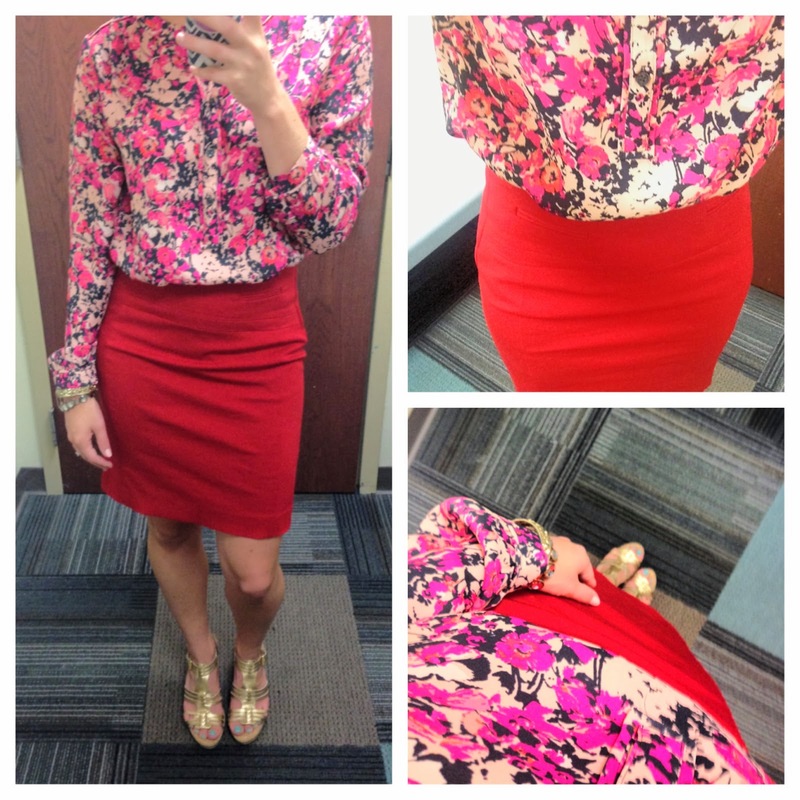 Since you can now pin my images, I thought I would share some of my previous favorite outfits below for easy pinning. I would love it if you would comment the link to where you pin it, so that I can connect with you on Pinterest also! Which one is your favorite!? So, what's next? Getting my boyfriend to charge up his fancy camera and dedicate some time to taking real outfit pictures! The iPhone has served me well, but it's time to get better quality pictures on here. Here's hoping I can convince him to dedicate an hour or two this weekend to a photo shoot! What's new with A Memory of Us! 1. Blake Shelton singing an acoustic version of "Over You"
2. SURPRISE appearance by Danielle Bradbery!! You guys, I am obsessed with The Voice. This made my day! I don't know if she goes to every show with him, but it was FANTASTIC. Anyways. Today's outfit is mixing stripes and floral print. I am obsessed with this shirt from Loft. (Seriously, I kept calling the store down the street from me asking when they were going to get it in stock.) You can see how else I wore it, here. I was having some issues while taking pictures this morning before work... i.e. could not stop laughing and struggling with my bracelet positioning. Oops! Happy Friday! As the title suggests, today and tomorrow are predicted to be the last days of warm weather here in Missouri for awhile. We're talking low 60s and frost to be expected Sunday morning. It should not be this cold already!! When I heard the weather forecast, I decided I would wear some of my warmer pieces one last time. While I am in a skirt and wedges, I feel like this outfit is still completely appropriate because the colors are darker. In the winter I will swap out the wedges and add some fun tights! Remember on Friday when I talked about my love for an Express skirt? Yep, I'm wearing it again in black. Tonight, the BF and I are celebrating 2.5 years together and going to the Blake Shelton concert!! I could not be more excited. I will be transitioning the outfit by changing the bottoms :). What are your plans tonight? Just checked my email and I won my first giveaway EVER from Fash Boulevard! Thank you, Anna!! I would love if you would follow me on GFC or Bloglovin'! A Memory of Us participates in several affiliate advertising programs. If you click or make a purchase through certain links on this site or any related social media platform, I may receive a commission. Although I participate in these programs and have sponsored posts, all opinions are my own.